The What: Nureva has added screen-sharing capability to its Span software, which it demonstrated at InfoComm 2017. This new feature enables groups to share multiple live screens within the same canvas, creating a dynamic collaboration space that includes all the applications, data, and content essential to team processes. The What Else: With Span’s screen sharing, users, both those in the room and those working remotely, can quickly share content from any application. Every participant has the flexibility to move, resize, and pin the live windows anywhere, and screen captures from the shared applications can be added to the Span canvas. Content from specialized applications can also be more easily shared with a larger team. For example, an architect who needs to share designs can simply open AutoCAD software, start screen sharing, and walk the team through several options. At the same time, other team members can add live windows to the same canvas showing a competitor website, a budget spreadsheet, and a Gantt chart from the team’s project management software. All the real-time information needed for idea generation, problem solving, and decision making is available in one place. Screens can be shared from users’ laptops, other computers and Span wall software. No additional hardware connection is required. Using the screen capture icon, anyone can take screen captures of the shared applications and add them to the Span canvas. Like any image in Span software, screen captures can be annotated, pinned, duplicated, resized, and deleted. The Bottom Line: Screen sharing in Span software is well suited for co-located or dispersed teams that need access to live content from multiple applications while they work together. 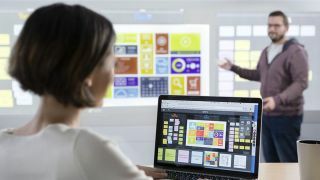 It is designed to make creative collaboration more informed, meaningful, and fluid, as teams can pull content such as design mockups, website templates, videos, spreadsheets, charts, and diagrams into dynamic discussions. Screen sharing will be a preview feature in Span software in July 2017.